After much conjecture prior to the trade period, Jared Polec has made his way to North Melbourne – with some company in Jasper Pittard. Polec finds his third club, and has grown from strength to strength as a player in recent years. He was critical to their ball movement in 2018, finishing as their second most prolific avenue inside 50 and the third most active player in to get the ball out of their own defensive 50. He also ended the year second for goal assists at the Power and finished fourth for stoppage clearances per game. North may try to further push the inside element of his game (Port really didn’t deploy him at the bounce), or continue to use him as an outside runner. Either way, it is likely that North have upgraded their midfield with this move. 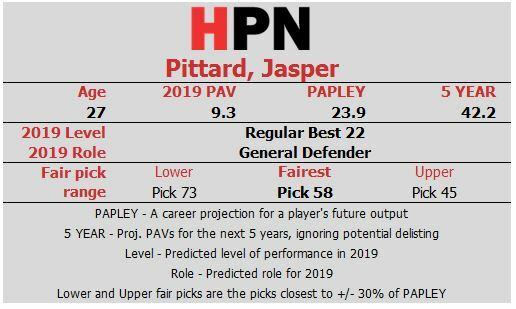 Pittard is more of a speculative addition for North – especially considering their strong backline in 2018. The former pick 16 in the 2009 draft has seemed as though he’s dropped in form for each of the last two seasons, moving from a very good 2016 to a pretty average 2018. Always a risk taker, this year he led Port for turnovers per game and has been in the top three at for turnovers in each of his last three seasons. Pittard’s value comes as a rebounding defender getting the ball away from the goals, but his turnover rate gave Port pause about using him in this role, as it must likely do for the Roos. If North work out how to use his talent effectively, it could be a shrewd pickup. The trade sees the two players and the Port third rounder (pick 48) swapped for a mid first round selection (pick 11) and pick 67. With both South Australian clubs rumoured to be interested in trading up for a high pick to grab one or both of Rankine and Lukosius, pick 11 could be a handy chip alongside their own pick 10. Otherwise, Port may be in a position to snag a couple of the second wave of SA players, such as Rozee, Hately, Valente or McLennan. For North, giving up pick 11 means they’ll need to consider where they think selections for tied prospects Tarryn Thomas and Bailey Scott will fall, and how they will match those for them. Season-long expert consensus has had Thomas around pick 10-15. However, recent draft power rankings suggest he may even fall beyond the top 20, so high bids may have become a lesser concern for North. Previous Post:What value does an undrafted mature age player have?